"Jean Eisenstaedt takes us on a bold and exciting journey into the world of general relativity, bringing insight and wit to a difficult subject. His explanation of the geometrical nature of the theory is masterful. Eisenstaedt is one of the few historians who has tackled in a clear way how the physics community first accepted relativity, then ignored it, and now uses it as an everyday tool in their work." --Jeffrey Crelinsten, The Impact Group, Toronto, and author of "Einstein's Jury: The Race to Test Relativity""Eisenstaedt's very readable book offers an excellent introduction to the fascinating history of general relativity, written by one of the leading experts in the field. Taking a broad perspective, it shows how Einstein's theory emerges from a long historical tradition, and how it continues to pose challenging problems to this day." 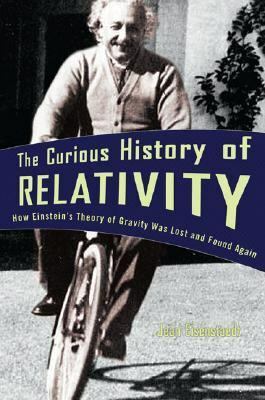 --J'rgen Renn, Director of the Max Planck Institute for the History of Science, Berlin"Jean Eisenstaedt's book is highly significant for the history of science because it is really the first serious look at the evolution of concepts in the history of general relativity after Einstein's death. It was the development of the concept of the black hole between the late 1950s and late 1960s that constituted the real birth of general relativity, and this story and the lead up to it is the story that Eisenstaedt tells here with unmatched authority. This book is, then, a founding text that sets out the historical context of this fascinating issue. The story of the discovery of black holes is a remarkable intellectual parable in itself, and Eisenstaedt tells it brilliantly." --Daniel J. Kennefick, University of Arkansas, Fayetteville, and coeditor of the"Einstein Papers Project""Beginning with Einstein's early work on a general theory of relativity at the start of the twentieth century, Eisenstaedt's book guides us through the attempts of several generations of relativists to resolve and detect this fascinating theory's strange physical consequences. From Schwarzschild's 'magical sphere' to Wheeler's 'black hole, ' fifty years of scientific indifference and even opposition to this puzzling branch of physics elapsed before relativistic cosmology was reborn at last, and the theory of general relativity recaptured the public spotlight." --Diana Kormos Buchwald, Einstein Papers Project, CaltechEisenstaedt, Jean is the author of 'Curious History of Relativity How Einstein's Theory of Gravity Was Lost and Found Again', published 2006 under ISBN 9780691118659 and ISBN 0691118655.